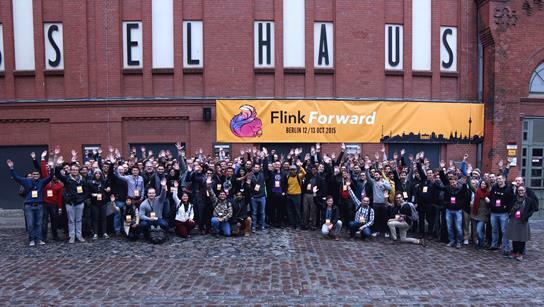 In October, Flink Forward 2015 took place in Berlin. Flink Forward 2015 brought together the Apache Flink developer and user community in order to exchange experiences and ideas on the current state and future development of the Apache Flink big data analytics system. During the two days at the Kulturbrauerei, an exciting conference space, there were many interesting talks by companies that are successfully using Flink in their projects, as well as visionary talks on the future of Flink. Further topics were the greater ecosystem, and the existing integration of Flink in open source projects like Apache Mahout, MongoDB, Apache Storm, or Google Cloud Dataflow. The conference served as a great venue to hear about the internal workings of the system directly from the committers, as well as to experience intensive hands-on training on Flink. In his keynote, William Vambenepe, lead of the product management team responsible for big data services on the Google Cloud Platform, presented how Google sees the future of data analytics and how streaming, a sweet spot of Apache Flink due to its pipelined execution engine, is at the heart of this. “At Flink Forward, I was impressed to learn about the impact and size of the Flink Community, with meetups and user groups now popping up in Silicon Valley, Chicago, Stockholm, and other places, including companies such as ResearchGate, Ericson, Zalando, Capital One, Otto, and others being involved”, said Volker Markl, Head of the Database Systems and Information Management Research group (DIMA) at TU Berlin and director of the “Intelligent Analysis of Mass Data” group (IAM) at DFKI, the German Research Center for Artificial Intellgience. Attendees visited Berlin for Flink Forward from all over the world, see a snapshot of the growing community behind the Apache Flink big data analytics platform below. Flink recently also was selected as one of the best open source big data tools by Infoworld . If you could not attend Flink Forward this year, you can take a look at the slides and videos, which are online now. Also, consider joining Flink Forward next year! Get involved in a local meetup (see the existing meetups here: http://apache-flink.meetup.com/), or start one if there is no Flink meetup near you!